Daniel graduated from the Catholic University of Americas with a Bachelor’s of Music in Vocal Performance. He has performed performed with several opera companies around the area including Summer Opera, Riverbend Opera Company, Loudoun Lyric Opera, and Maryland Lyric Opera. 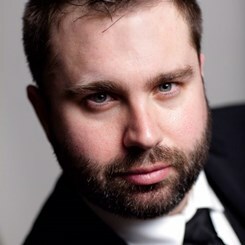 For over a decade, Daniel has been involved with The American Center for Puccini Studies which often presents operas along with source material and historical context of the work. He has had the pleasure of presenting world premiers of two operas: Agamemnon by Andrew Simpson and Norton: A Civil War Opera by David Chávez. The latter of which he created the title role. Currently, Daniel performs with the Washington National Opera at the Kennedy Center. Request Lessons with Daniel Sherwood today!